Donated Orthodontic Services (DOS) in New Jersey has surpassed a milestone $1 million in donated treatment since its inception in 2009! 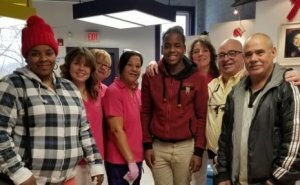 More than 100 orthodontists and 14 dental labs donate their time and expertise to DOS in New Jersey, which has enabled more than 180 young, low-income children to receive orthodontic care. Patient Jose and his parents with Dr. Barry Raphael and crew. DOS is a program of the American Association of Orthodontists and is operated by Dental Lifeline Network. Dr. Barry Raphael was able to provide the $6,500 in donated orthodontic treatment which surpassed the $1 million mark.